Rocky is my first German Shepherd! i bought it home when it was 6 weeks old. it is 2 months old now. Before bringing the GSD, many people said that these are very aggressive dogs and advised me not to buy it. So for all those people who think the same, i want to tell u that GSD is the best dog breed in the whole world! They are very intelligent and easy to train also! Eagerly waiting for my pup to grow fast!!! Hello, Srikar. We are so glad you decided to share your German Shepherd puppy with us today. Thanks to you for taking the time to come by here and share little Rocky with us right now. Love that photo - what a cute picture. Makes me want to rub that scruffy little face and smell me some puppy breath. Oh, I do miss that. He looks like he is having such a fun time but also he looks so cute and inquisitive too. What a little sweet heart. I imagine that you get plenty of exercise just keeping up with Rocky too but having a puppy can be so much fun. And readers,we encourage you all to let us know what you think about the above story about Rocky, and many others sent in by readers (found throughout this site) by leaving some interesting comments below. Thanks so much to all of you for stopping by and reading along with us here. 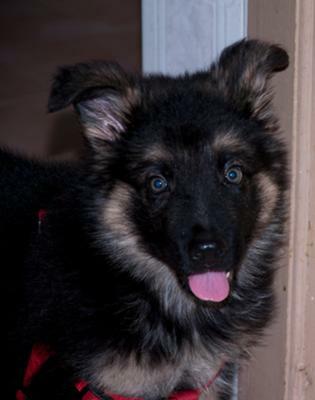 Comments for My German Shepherd Rocky!! !